Do you miss those days in Little League when everyone received a trophy no matter how poorly you played? Now glory can be yours, for the Nobel Peace Prize is within reach of even the most incompetent fools. Just open a box of Cracker Jack. Do you miss those days in Little League when everyone received a trophy no matter how poorly you played? 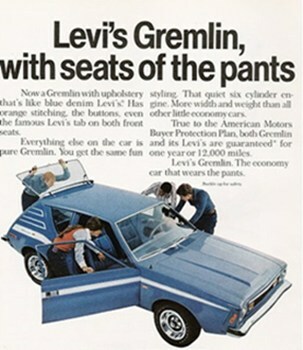 Sadly I had a disadvantaged childhood. Back in those days the outcome of schoolyard games were not equal. We had winners and losers. My self esteem still has not recovered. Had the People's Cube been around back then, things might have turned out very different. Yes, Comrade Goldstein, you are the latest recipient of Pinkie's prestigious Beet of the Week Award! Pinkie, I commend your decision to award Beet of the Week to a new comrade with little experience or accomplishments, knowing that in the future he will more than live up to the honor. However, I’m uncertain that REG is the best choice given his propensity to post highly offensive material. I fear he has too far to travel to reach the height of mediocrity usually required to receive the award. To avoid future embarrassment and tarnishing of your stellar record should REG fail; I suggest you start him on a daily regiment of shovel whacks. I posted a thumbnail of Maksim's equal picture in the right-hand column. There are many more like this at BuzzFeed in a thread called Obama Wins Everything! I share the sentiment, but we must be careful not to cheapen such a highly prestigious award as Beet of the Week by giving it to new comrades who have spent 12 days on the People's Cube and posted a total of three comments. You boys with your tunnel vision just don't see the great big picture that I do. This isn't about rewarding achievement, or accomplishment, or even results. In fact, I defy any one of you to name one thing in The Party that even remotely smacks of any of those things. Surely you've noticed, for example, that for the past 30 years, we've been saying we have less than 10 years to save the planet from global warming. What happens should we ever achieve or accomplish anything? Do you really want all that money to stop coming in? Don't you enjoy all that power over the multitudes? No, methinks the only one in danger of being "cheapened" or embarrassed by this is Comrade REG, should he not live up to the expectations we have set for him by handing him this award. It's a Call to Action. Let's sit back and see if he heeds it by coming up with more creative ways to raise awareness of the need to call for even more action . . . or if he does the unthinkable, and cuts through all the crap and verbs and . . . just acts. Then you'll see some real action from my shovel. Are you suggesting that Dear Leader was not worthy of the Cracker Jack esteemed Nobel Peace Prize? Just 9 months in office and just only a sh*8load a mere 14.2 trillion later on his lifetime rule of the USSA (after we aquire more necro-proxy votes for the next election cycle of course) Dear Leader has surely accomplished just as much well almost as much er, MORE than New Prole Comrade Fresh Fisher.... RAUM EMMANUAL GOLDSTEIN... No? Indeed. Where is mine? I started out nearly a year ago as a mere prole, and now look at me. Leader of a rag tag band of revolutionary Red Guards, and THE FREAKING COMMISSAR OF TIME. But do *I* get a Beet of The Week? Noooo...... I think Pinkie is biased. (I say this because I am wearing a kevlar helmet, and am testing a program to redistribute her whacking time elsewhere). I wonder if my chicken recipe would work for duck? Did someone mention DUCK? CRISPY DUCK, perhaps? My favorite! I applaud Supercommissar Maxism's more equal Photoshop/Agitprop skills. Again, he hits the nail on the head. and torso, and sensitive extremities. And what clever subtleties in the Cracker Jack meme...our Cracker don't know Jack! What an amazing age we live in, comrades. Even Chauncey Gardener, the unlikely but charmed President in Being There, walked on water but never ever won the Nobel Peace Prize. I'll send the duck your way Comrade General. 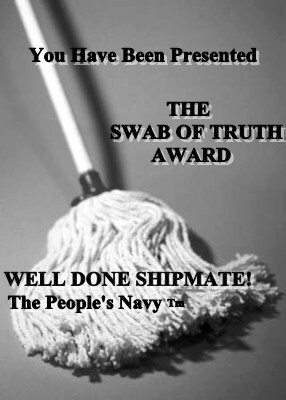 It is with great honor to present COMMISSARKA PINKIE with the following award from the People's Navy! For your brilliant insight as to why you awarded your prestigious "Beet of the Week" to a rookie who is still in his diapers, using the very same logic as the Nobel prize committee did to award theirs to, 'The One'. Make room on your "I Love me Wall" in your Dacha to hang this. Figures, mention DUCK and Mousey-Tounge comes PEKING in. I denounce Commodore Snoogie Woogums for his horrible pun and demand an apology for making me nearly spew vodka on my keyboard. Because of course, it would never be my fault if something like that happened. I DENOUNCE Colonel 7.62 for not fully appreciating my NOBEL attempt at humor. You really do take the PRIZE sometimes in your denouncements Colonel. Oh and I also denounce General Mousey, for not inviting me to share some of that Duck you sent his way, mighty un-progressive of that fiendish feline if you ask me. I wouldn't have denounced you if your marines hadn't boarded my yacht and demanded papers, vodka and bribes. That's intolerable to a fellow Inner Circle(TM) member. You may have noticed your fleet had scheduling problems lately? 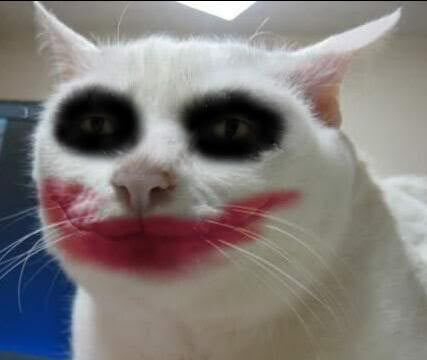 That's my revenge. They were sent only to inspect and ensure the new engines you installed were fully operational and would pass your initial 'shake-down' cruise. There seems to be a little confusion on what their orders where regarding what a 'shake-down' cruise really means. Please accept these little tokens from me as consolation for this little misunderstanding as to what my orders really were. 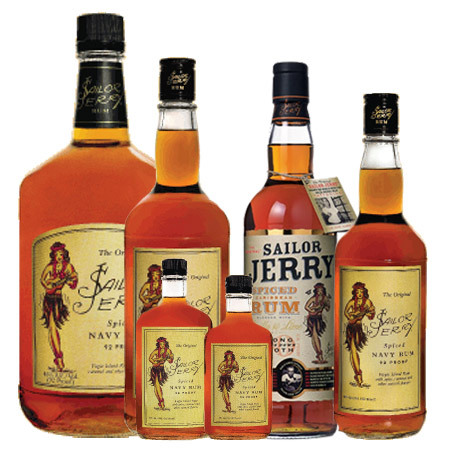 Note to Self.......No more recruits from ACORN will be accepted into The People's Navy. TICK TOCK!tick tocK. tick toCk. tick tOck. tick Tock. ticK tock. tiCk tock. tIck tock. Tick tock. TICK TOCK!tick tocK. tick toCk. tick tOck. tick Tock. ticK tock. tiCk tock. tIck tock. Tick tock. TICK TOCK!tick tocK. tick toCk. tick tOck. tick Tock. ticK tock. tiCk tock. tIck tock. Tick tock. TICK TOCK!tick tocK. tick toCk. tick tOck. tick Tock. ticK tock. tiCk tock. tIck tock. Tick tock. TICK TOCK!tick tocK. tick toCk. tick tOck. tick Tock. ticK tock. tiCk tock. tIck tock. Tick tock. TICK TOCK!tick tocK. tick toCk. tick tOck. tick Tock. ticK tock. tiCk tock. tIck tock. Tick tock. TICK TOCK!tick tocK. tick toCk. tick tOck. tick Tock. ticK tock. tiCk tock. tIck tock. Tick tock. TICK TOCK!tick tocK. tick toCk. tick tOck. tick Tock. ticK tock. tiCk tock. tIck tock. Tick tock. TICK TOCK!tick tocK. tick toCk. tick tOck. tick Tock. ticK tock. tiCk tock. tIck tock. Tick tock. TICK TOCK!tick tocK. tick toCk. tick tOck. tick Tock. ticK tock. tiCk tock. tIck tock. Tick tock. TICK TOCK!tick tocK. tick toCk. tick tOck. tick Tock. ticK tock. tiCk tock. tIck tock. Tick tock. TICK TOCK!tick tocK. tick toCk. tick tOck. tick Tock. ticK tock. tiCk tock. tIck tock. Tick tock. TICK TOCK!tick tocK. tick toCk. tick tOck. tick Tock. ticK tock. tiCk tock. tIck tock. Tick tock. TICK TOCK!tick tocK. tick toCk. tick tOck. tick Tock. ticK tock. tiCk tock. tIck tock. Tick tock. TICK TOCK!tick tocK. tick toCk. tick tOck. tick Tock. ticK tock. tiCk tock. tIck tock. Tick tock. TICK TOCK!tick tocK. tick toCk. tick tOck. tick Tock. ticK tock. tiCk tock. tIck tock. Tick tock. TICK TOCK!tick tocK. tick toCk. tick tOck. tick Tock. ticK tock. tiCk tock. tIck tock. Tick tock. TICK TOCK!tick tocK. tick toCk. tick tOck. tick Tock. ticK tock. tiCk tock. tIck tock. Tick tock. TICK TOCK!tick tocK. tick toCk. tick tOck. tick Tock. ticK tock. tiCk tock. tIck tock. Tick tock. I have to admit perfect TIMING on your post! Comrade Commodore, your apologies are accepted. Would you care for me to release the survivors, or should I just toss them to the SEIU to deal with? Please toss them to SEIU so they can enjoy some free 'healthcare' from those fine folks. Looks like Betinov has been drinking the extra formaldehyde from the mass graves too. Somebodies gotta do it comrades. Proles just haven't been dying like the last most recent edit before the 5th final edit of the 5th 5 year plan professed, and I just have to keep up my quota of formaldehyde or the formaldehyde funds will dry up and we wouldn't want that now would we comrades? 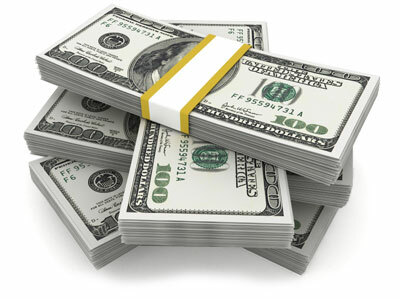 After the Dear Leader (apuH) received a surprise visit from the Nobel Sweepstakes Prize patrol, I’m thinking….You know? I could win that too and be justalmost like the Dear Leader (apuH). According to the enclosed instructions, I just have to enter to win. As a matter of fact congrats to all Comrades of the collective for the joy, they have shown in 'The One's' well deserved achievement! 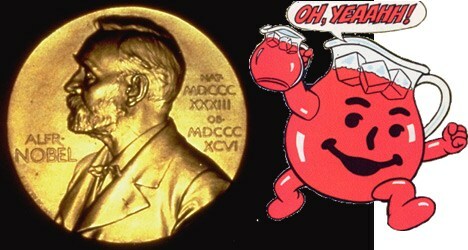 Let's all have a glass from the same pitcher the Nobel committee has been drinking from when they awarded this. A Toast to the Nobel Peace Prize!!! Ooooooo.... Shovel whacks! Isn't that what I'd receive at Pup's Pleasure Party Palace? No, not those kind of shovel whacks Comrade Fresh Fish. Even the whackos calling into "Coast-to-Coast" (a late night radio show specializing in bigfoot, alien abductions and other fringe subjects) tonight are scratching their heads and asking "What the...?" regarding the latest annointing of the Annointed One. A couple of little hints as you make your way on your journey to be true, more than equal, equal comrade here on the Cube. Serious Groveling and blatant Toadyism are traits that are valued and nurtured in a prole. Sucking up to Red Square always brings a brighter shade of Red to his cube. Telling Commissarka Pinkie, that there is NOTHING on this planet that woman could ever wear that would make her look fat goes a long way. After you master those basics, I'll fill you in on the backstabbing, bribery and the usual shenanigans that goes on here as we make our way into the glorious world of next Tuesday. You've got great potential to be a complete leech on society REG, I'll be watching you to see how you fare here Comrade. Betinov, Drinking formaldehyde and listening to Art Bell, er George Noory... now why didn't I think of that? Speaking of which, I don't know why Commodore Snoogie refuses to accept his origins? I think he may need some more formaldehyde... being from extraterrestrial origins puts him right up there with The One and the Nobel Prize Committee, walking manifestations of afterlife... many are afraid of death, it's o.k. Commodore. Just don't forget to wear your black Nike's. I am most surprised and flattered by your recognition of my myriad achievements within the collective (although I’m still not certain as to exactly what those are, but I will trust your wise judgment in the matter)…especially from such a fetching comrade as yourself. My gratitude aside, no comrade is any more capable (or incapable) of the potential near achievements which have been almost but not quite achieved by yours truly (inshahobama). Indeed, I could not have achieved the very nearly achieved achieveable achievements that may or may not soon be achieved without your unwavering collective support. I must therefore sharethe honor of the most coveted and sought after honor of the Beet of the Week with the collective equally. My gratitude aside, no comrade is any more capable (or incapable) of the potential near achievements which have been almost but not quite achieved by yours truly (inshahobama). Indeed, I could not have achieved the very nearly achieved achieveable achievements that may or may not soon be achieved without your unwavering collective support. I must therefore share the honor of the most coveted and sought after honor of the Beet of the Week with the collective equally. Comrade Goldstein: THIS IS NOT ALLOWED! Yet this is just what I should expect from someone who attempted to shove Christofascist hate speech down my throat in the form of posting on one of MY THREADS a picture of something that belongs in a giant vat of urine. I'll bet one of your favorite movies is The Robe, isn't it? I was once subjected to that movie as part of a forced Christofascist indoctrination that didn't take thanks to my open, tolerant mind and my unique gift for being able to reason and think for myself instead of relying on Fox News or talk radio to do it for me like it seems to have done for you. So I can only say that--what was I saying? Oh yes, The Robe. I remember what happened when Richard Burton gave the donkey to the boy. Do you remember what the boy, in turn, did with the donkey? I tell you, it was beyond despicable, and I've been seething with outrage ever since. It is totally beyond everything The Party stands for. When I give you Beet of the Week, you do not turn it around and share it with, or even give it, to ANYONE, even if it's the entire Collective. In the first place, even if you've earned it (and clearly there are those here who say you haven't) it is not yours to do with as you see fit or even as it amuses you. And in the second place, you have no way of knowing exactly to whom you should give it. There are some, you see, who need it more than others, and others (Colonel 7.62 comes to mind) who have no need of it at all. But I am a member of The Party, a made Progressive as Theocritus would say. That makes me more equal than you, and therefore I know better than you what should be done with your Beet of the Week, especially if you think you have no need for it yourself. Therefore, I hereby confiscate appropriate your Beet of the Week Award that I may redistribute it to someone more deserving. And that most assuredly does not include everyone in the Collective--especially Colonel 7.62, who would only cheapen its prestige with his notion of using it as a "chick magnet." Honestly, you could learn so much from Maksim. He gets Beet of the Week all the time, more than anyone else. Not fair, you say, especially since he's in charge of the nominating forms? Maybe, maybe not, but that's not for him to decide--and he knows it. He would never dream of sharing it or redistributing it to others, not when he knows The Party is better able to do that for him. Why, I'm almost tempted to redistribute your Beet of the Week to Maksim, simply because he understands that with it comes great responsibility--not for himself, silly goose--but of The Party! When the nObel prize was announced, I knew it was finally time to join The Cube. It was just too good to be true! To celebrate the the nObel prize and to contribute to the greater good, I would like to make a beet casserole for everyone! As a citizen of a community in the Statist State of Kalifornia, I have been a member of The Party for a long time, but did not know it because I could not read or write. But "an acquaintance" from the Free Republic of Texas informed me that there they must have MORE than a beating heart (oh,wait...a face) and English as a second language to obtain a driver's license, vote, and receive free care! And so I began to feel very lucky to live in SSK and decided to become more involved in The Party to avoid being sent to the gulag for fraternizing with a capitalist. I align myself with the Cube each night after I tuck my four little beets into bed. Maybe next year, we will celebrate the nObel prize with some fireworks from Iran when the award goes to the heroic police who kept the violent, disappointed voters at bay! Perhaps The One[sup]tm[/sup] should recieve a Pulitzer prize for "Dreams From My Bomber"? We need more female comrades on the Cube to keep the appearance of orderliness. Someone has to cook beet casserole for the boys in the bunker too, since the official Party Kook(TM) Comradka Che Gourmet is AWOL and Sister Massively Opiated, who is the Commissar of Housekeeping, Disappearances, Composting, and Limo Service, has been temporarily decommissioned. Of the few remaining womyn, Leninka has a goatee, Pinkie is a serial shovel-wielding assassin, Comradka Lenya has a male name, and Ivana Tinkle is a cat. In honor of your excellent management of the Peoples Time[sup]tm[/sup] I award you a custom made Maovado. Comrade Castrate, you simply must stop creating clocks. Your little island nation will remain trapped in the 1950's until you do. Pinkie, so what if I would use Beet of The Week(TM) as a babe magnet? I feel entitled to one, and that's all that matters. My self esteem will assuredly suffer, and when that happens, I do vindictive things. Despite my powers over time, a yacht that gets escorted by Commodore Snoogie's security ships (or is that shadowed and watched?) and a whole bunch of Revolutionary Red Guards laying around the compound drunk and shooting at things, I still have trouble getting babes. A Beet of The Week(TM) would do so much to make me feel better. And feelings are what it's all about. Welcome Comrade Casserole! It is most equal to have a woman doing the cooking around here, as strangely enough it's been men and the odd cat or dog doing such things. I was at least hoping for SOME FORM of gratitude from Commissarka Pinkie for my giving her "The Swab of Truth" award. News flash Pinkiekins, you might think the Swab of truth Award is just like a Nobel prize that anyone can get just because they aren't BUSHITLER or a registered Rethuglikkan but you would be wrong, wrong, wrong. You were in fact the second recipient only in the entire history of the Award! And not even a measley thank you or gee, that's kinda nice, or even a short acceptance speech that included the word "I" at least 20 times. Besides what a better way to help him get progressive chicks than by handing them a mop and pointing them toward the kitchen. Why thank you Comrade Commodore. I think I don't deserve this award, but I will humbly try to accept it, and the honor it bestows upon me. This will allow me to put something in the hands of those in my galley so that they can clean for me. I'm sorry, Snoogie, but you didn't give me a chance. I was still dealing with Comrade Goldstein. I'm dealing with a great many things right now. You have to bear in mind what a big mess I inherited when I first came into the Collective. If you want something fast, you'll have to go to the private sector--but you wouldn't, would you? And welcome to Casserole Czar. I should've known there was a new female in the Collective when I came in here to see all the male comrades (save Theocritus) wearing pants and controlling their flatulence for a change. I remember when they did that for me. It must've lasted all of three days. Oh well, at least I'll be able to breathe until Monday. I light of your explanation, I feel truly guilty now. Which of course is just natural for a prog such as myself, as I feel guilty about everything since I am a white male of european descent and the cause of all the misery in the world. I cannot re-award you since the Colonel has now accepted and most graciously I might add. Though, I can offer you this in light of not really giving you a chance to respond to the Honor I bestowed upon you and felt I had to withdraw it. Commissarka Pinkie, why the obsession with pants? Boxers work just as well, and provide support. Or, for the bold and daring male comrade, there is the UtiliKilt, made in Progressive Seattle. Nothing like a little ventilation, and letting it all hang loose. I will be happy to assume the mopping job in the kitchen. It is my joy to grovel, since my purpose in life is to be a servant of The One as Demi and Ashton instructed me (and my first grader...and my second grader). So glad they didn't stop the Principal from sharing THAT one at the pep rally! Ah, Snoogie! You have discovered the heretofore unknown secret shortcut to a Commissarka's mushy heart--chocolate and lots of it! Thank you, thank you, thank you! And kissy-kissy all over your baby soft cheeks, and a noo-noo-noo on your cute button nose! Congratulations on your Swab of Truth Award. 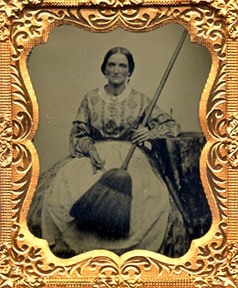 I'll bet you can hardly wait to see how many hot chicks you can attract with that mop! A good thing you have that Swab of Truth, Colonel! You may need it just to "beet" them off at this rate! I am truly honored! Words almost fail to describe the joy I feel right now. Rest assured the award will be placed in a spot in the People's Naval headquarters, where all can view it once they enter!!!!!!!!! Those chocolates for your special order came in. I gift wrapped them and sent to the address of your special lady as you requested. I'm sorry for the delay in shipping as I know you had requested expedite service, seems the Cuban Mail Service workers need shot better organization. I hope I haven't shipped those too late. Thanks for your order and please keep the Cuban Travel Store in mind for all your gift needs. Ahhh. I am familiar with the Cuban Travel Store. But I was afraid to admit this because I thought maybe all pleasure seeking may have to be approved by Red Square first and that one might be tempted to enjoy something that someone else might not also get to experience thus rising above, in an unacceptable way, all of his/her peers? Perhaps the best thing about this ceremony was that Kanye West was not present and could not tarnish the glamour of the ignomious prestigious nobel peace (inventing dynamite is peaceful?) prize! Well The Great Castrate[sup]tm[/sup] and the Cuban Travel Store[sup]tm[/sup] always rise to the occasion. Our motto, We Aim To Please[sup]tm[/sup]. I didn't realize it was a man's name! Ask Neil Simon about it... (See my reply in White House Announces Olympic Boycott thread). Hurry! You may have already won the Nobel Prize in our Nobel Clearing House Sweepstakes™! Buy yours today before these products are banned by the neo-kulak kapitalists! Wow the world collective by Trick or Treating this Halloween as a proud Nobel Prize Winner! 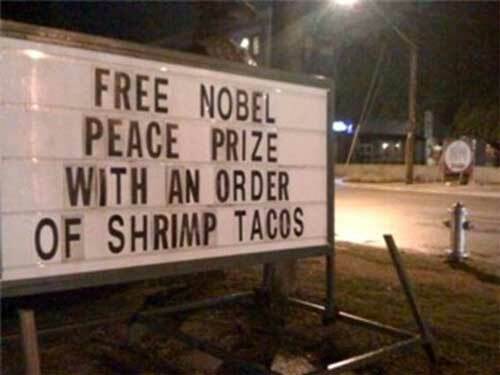 Nobel Peace Prize - now free with an order of shrimp tacos! I took out the trash and am still waiting for my Nobel. And Pinkie, I always wear pants, except when I don't. Now I don't do drag. Once I went to a Halloween party in camp drag--didn't shave the mustache I had then, and when I saw the pictures I turned whiter than Glen Beck and tore them up. Pitched the costume. Of course I did go as Monica and hand out cigars. And as for cooking. Believe it or not, I can cook. Not for families; never learned that, but no one has died yet. Would anyone care for escalloped beets? What about a terrine of beet and potato? Beet blinis? I can make three gallons of borscht using two beets, one potato, and one tablespoon of old, runny, clotted sour cream. I'm a regular Betty Crockervitski.